This trip took us to Historic San Antonio. We have been there before many times, but never with our trailer so that we could spend more time to explore. The weather cooperated with us so we had a nice visit. 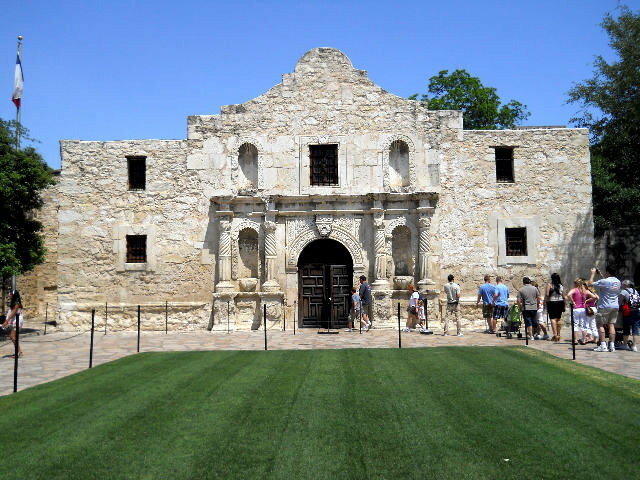 San Antonio is Alamo Country. The Cradle of Texas Liberty. 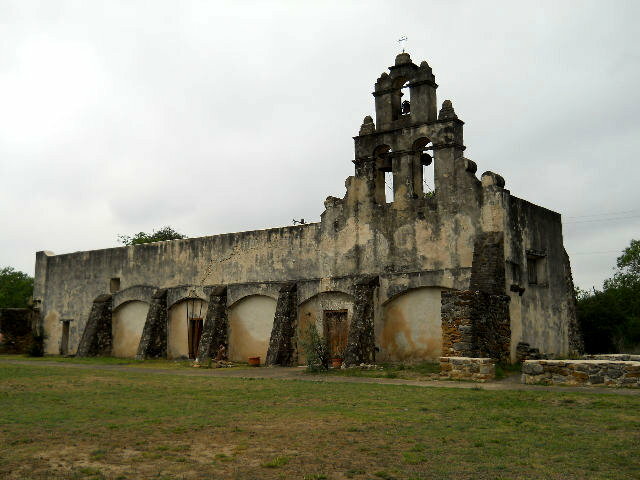 The site that was to become San Antonio was a Coahuiltecan Indian village when a Franciscan mission, San Antonio de Valero, and its protecting fort were built in 1718. 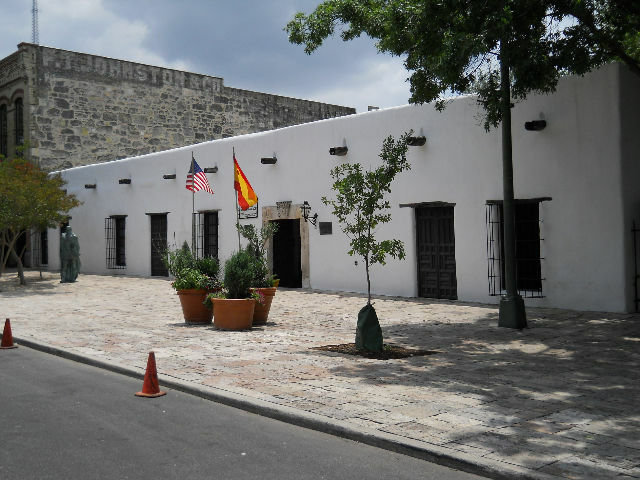 To preserve Spain's hold on the region from the French who were in Louisiana, the Spanish government brought several dozen colonists to the mission in 1731. Four other missions were built along the river south of town. The missions flourished at first but eventually were weakened by increased hostility from Apache and Comanche tribes. Inadequate military support made matters worse. 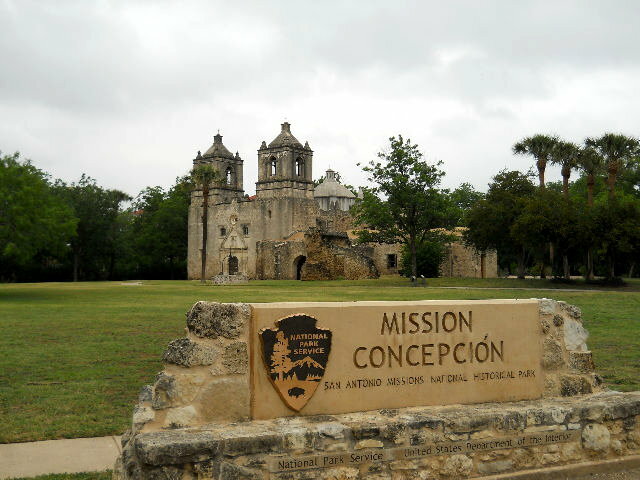 By 1794, the mission era had come to an end, and the Alamo was secularized, becoming a military post. It's name was changed to Alamo de Parras by Spanish soldiers. In 1835, Texan volunteers took control of the Alamo by defeating Mexican forces. In response, Gen. Antonio Lopez de Santa Anna led an army of 4,000 against a few hundred Texans including James Bowie, William Travis and David Crockett. They stood their ground for 13 days until Santa Anna's troops stormed the north wall. "Remember the Alamo" was born. We hope you enjoy our visit to San Antonio. [Thursday] May 12th we left Richmond about 11:00 am headed west on IH-10 to San Antonio. We stopped near Columbus and ate lunch as we watched an approaching rainstorm from the west. By the time we finished our sandwiches and got back on the Interstate, we met up with the wind, rain and lightening & thunder. That lasted from Columbus to Luling. Afterwards it was clear sailing to SA. We checked into Mission Trail RV Resort for the week. 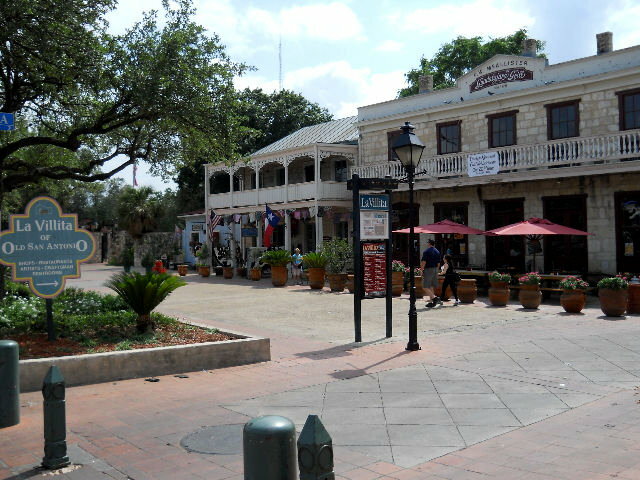 It certainly didn't meet the resort category, but it served us well as a home base for our exploration of San Antonio. [Friday] We drove to downtown in the morning to go to the San Antonio Visitor Center and see how the downtown parking would be. That didn't work out too well as we never really found the Visitor Center and the parking was about $10 a day in the downtown area. 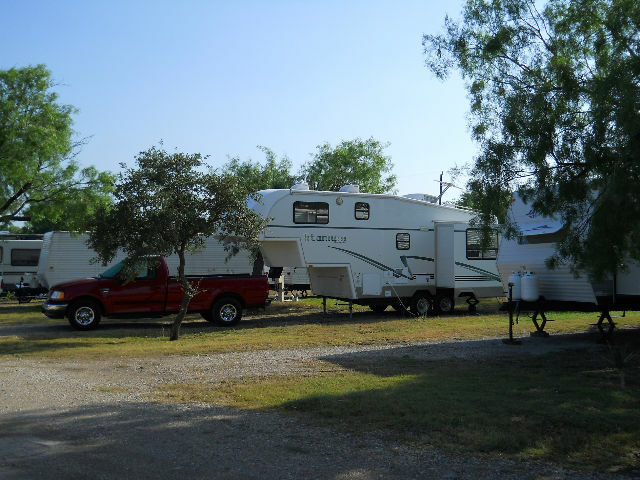 We drove back toward our RV park and stopped along the way at a motel and picked up brochures at their rack. We stopped at Wal-Mart for some lunch items, and went back to the trailer. After lunch we decided to see how the Via Metro Bus System would work for transportation downtown since a stop was right next to the Wal-Mart across the freeway from us. We rode #34 from Brooks City Base to downtown. It took about 45 minutes for $1.10 each with no parking woes. 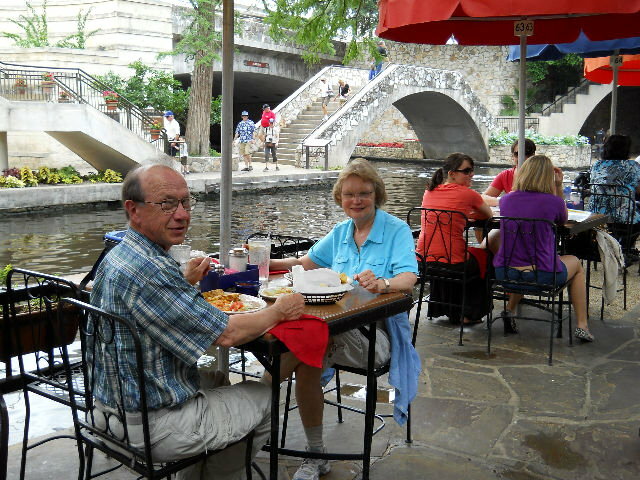 We walked along the Riverwalk and found the Visitor Center across from the Alamo. After that we walked to the Via Customer Center and purchased Senior Half-Fare passes for each of us for the month of May for $15 each. We then rode #34 back to Brooks. We are now set for easy trips downtown each day - and leave the driving to the Via driver. 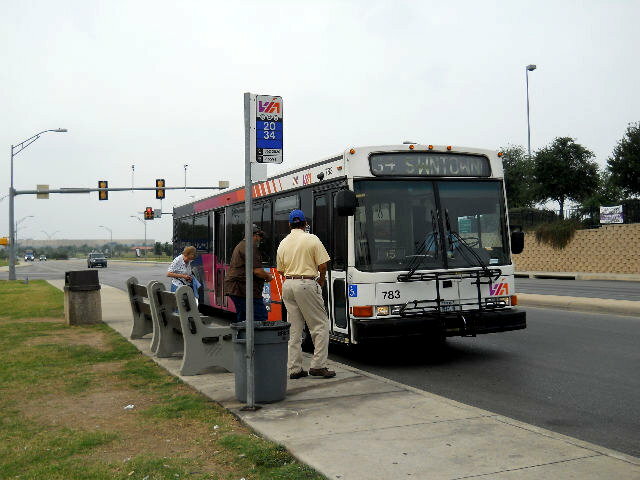 [Saturday] We rode the bus into downtown and saw two IMAX movies, the first was Alamo, the Price of Freedom, the Greatest Battle in Texas History, on the "Biggest Screen in Texas." The other we watched was about the Hubbell Space Telescope, with many spectacular views of the universe through the Hubbell. Both were very interesting and the Hubbell IMAX was in 3D. 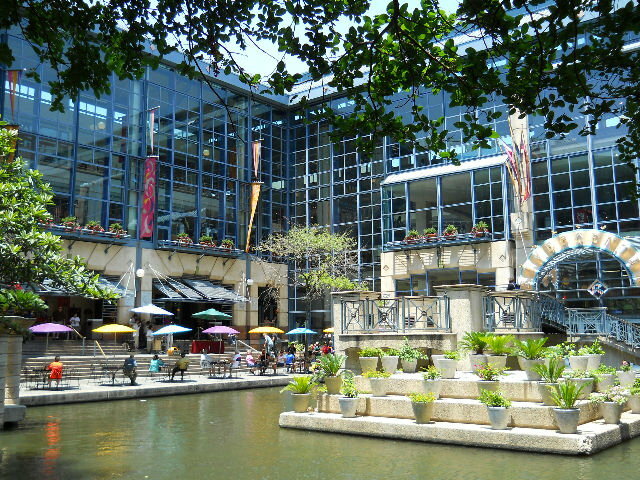 Afterwards, we walked through the RiverCenter Mall, which is a large downtown shopping mall right across from the Alamo. It housed the IMAX Theater and was situated on the Riverwalk. We sat on a convenient rock wall and ate our picnic lunch while listening to a live Mariachi band and watching the river taxis streaming by loaded with tourists. We then walked through the historic Menger Hotel and looked at the many historic photos lining the hallway. Across the street at the Alamo we enjoyed a tour of the mission and grounds. At the end of the day, we rewarded ourselves with ice cream cones at the nearby Häagen-Dazs before we caught the #34 bus back to the RV park. < RiverCenter Mall. 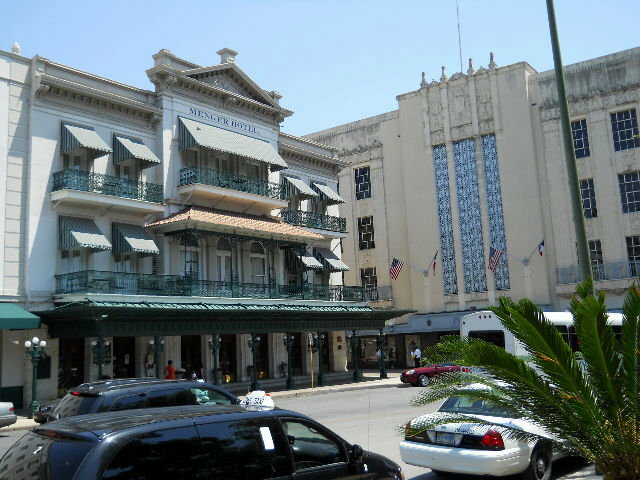 < Historic Menger Hotel. < The Alamo. [Sunday] When we are in an area where we can attend church on Sunday, we always try to attend. 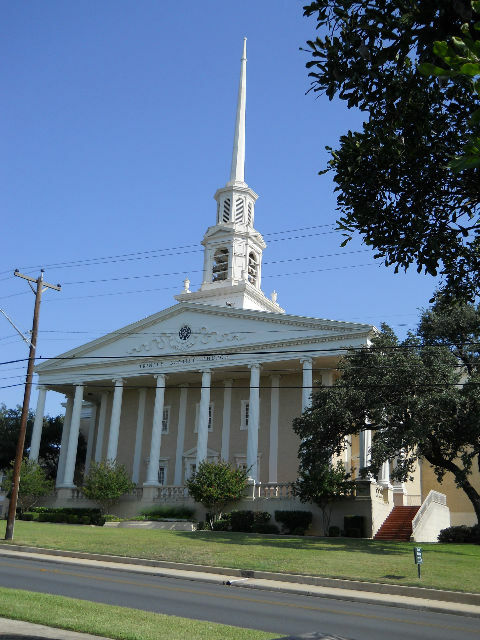 We chose to visit Trinity Baptist Church, conveniently located just north of downtown. We enjoyed the mostly traditional service and a meaningful sermon by Dr. Leslie Hollon, Senior Pastor. After lunch back at the trailer, we drove to the National Park Service Visitor Center at the Mission San Jose y San Miguel de Aguayo. We took the ranger-guided tour of the grounds. The church is being restored on the inside, so it was not open, except for us to look inside from the front door. We were there about 2 hours until the park was about to close. Unfortunately we discovered that our truck had been broken into and fortunately, only our lunch box containing water and a few snacks was stolen. Lesson: Don't leave anything in view that might be thought to be of value, even if it is not. < Trinity Baptist Church. < Mission San Jose (ca. 1720). [Monday] We rode #34 downtown and took the Rio San Antonio Cruises river barge ride on the river. It is one of the "touristy" things to do. It gives a nice leisurely view of the riverwalk and the boat driver lets you know what you are looking at. 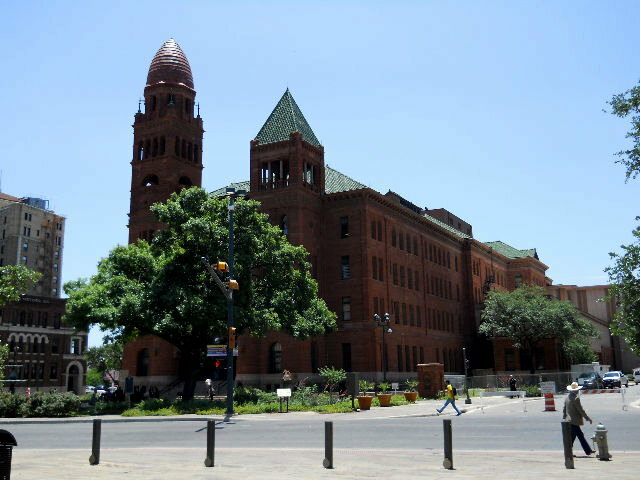 After a picnic lunch, we rode the blue Via Streetcar on its circular route of the downtown area and stopped at the historic Bexar County Courthouse (ca. 1897). It is a masterpiece of native Texan granite and red sandstone, roofed in distinctive green and red tiles. The Courthouse has been restored on the outside and looks impressive. However the inside has been remodeled at some time in the past and just looks like an office building. It is still in use as a county courthouse. We then walked to the adjacent San Fernando Cathedral and toured it. 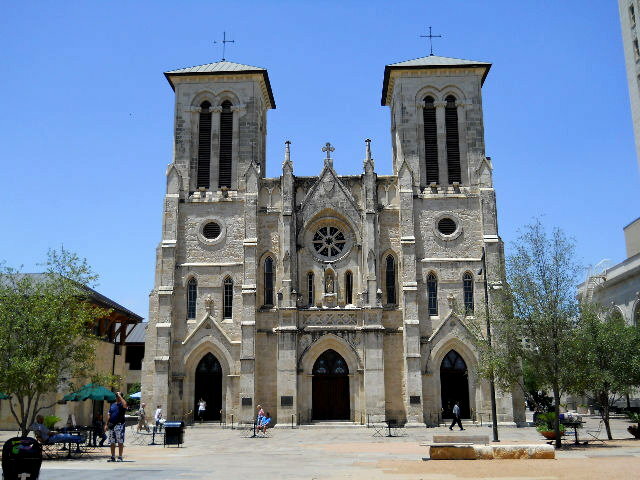 San Fernando Cathedral was founded in 1731 and is the oldest, continuously functioning religious community in the State of Texas. 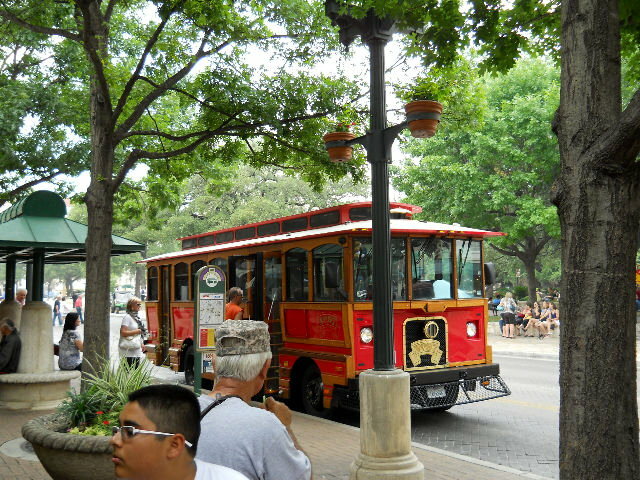 We rode the blue streetcar back to the Alamo where we caught the red Via Streetcar and rode it to the Historic Market Square shopping center. 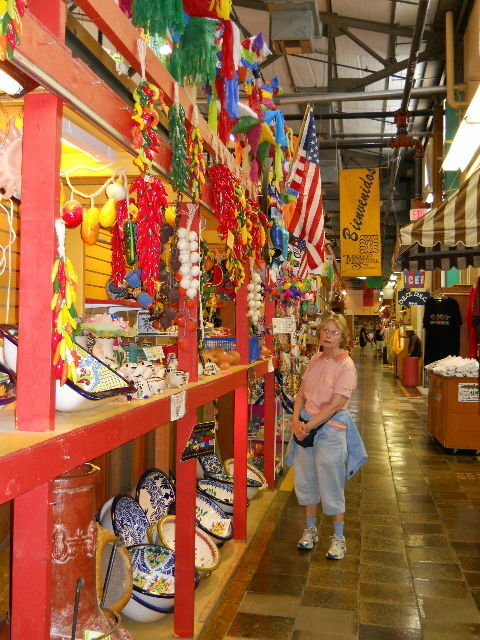 Market Square is the largest Mexican marketplace north of the Rio Grange and has over 100 shops for clothing, folk art, pinatas, jewelry, pottery, textiles and more. After a little looking and shopping, we rode the red streetcar back to St. Mary's St. where we caught the Via #34 bus back to our truck in the Wal-Mart lot. < San Fernando Cathedral. < Market Square. [Tuesday] In the morning we drove back to the Mission San Jose to finish the tour that we had not completed on Sunday afternoon. After lunch at the trailer, we drove about 15 miles to the SAS Factory to take their guided tour. They are really set up for tourist in their unique Visitor's Center. It is both a museum and a sales store of the SAS shoes. The factory tour was excellent, and we were the only folks taking the 1:30 pm tour so we were able to get all our questions answered. The shoes are all made by hand, with machine assistance, and there is a lot of skill required by the operators. No photos were made inside the factory, but there were plenty of things to enjoy and photograph outside the factory gate. 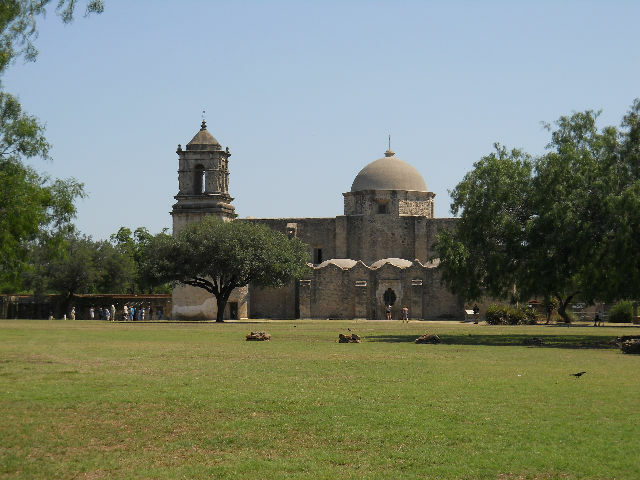 On the way home, we drove by all 4 of the San Antonio Missions National Historical Parks, to preview them for visiting on another day. 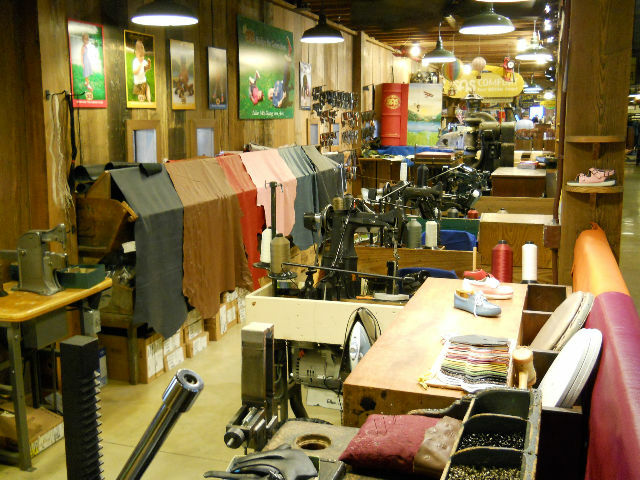 < SAS Shoe Factory Visitor Center. < Some of the equipment use to make the shoes. 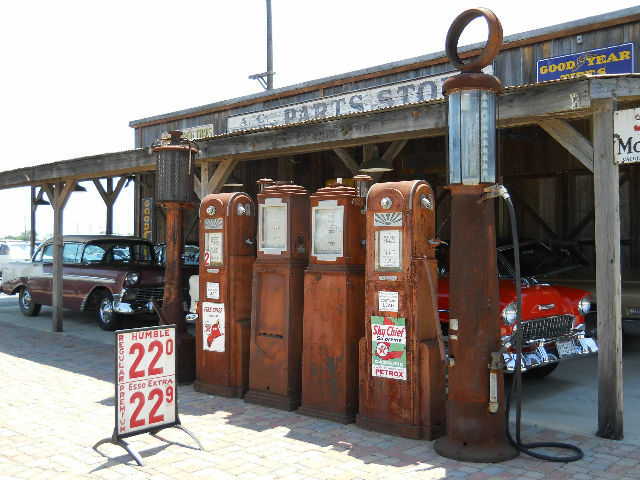 < We wanted to fill up here. [Wednesday] We rode #34 into town again and stopped at the King William area to take the tour of the Steves Homestead. The site includes a lavish Second Empire mansion built by German immigrant Edward Steves in 1876. The home is located on the Riverwalk. 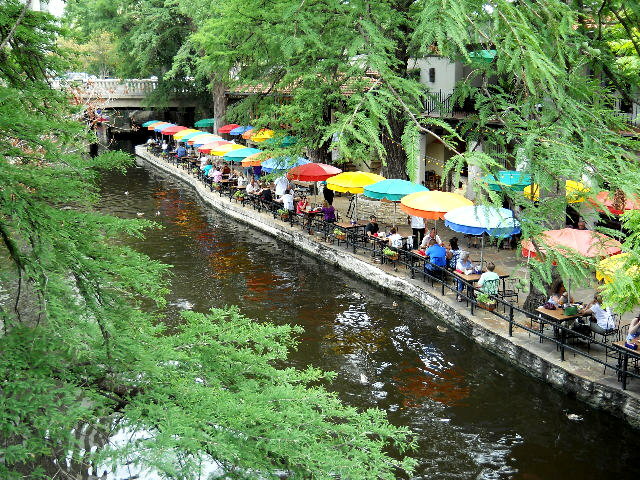 After the tour, we took the Via Streetcar to the Alamo area, where we stopped to eat on the Riverwalk at Casa Rio Mexican Restaurant. We enjoyed the lunch and watching the boats glide by and seeing all the ducks begging for table scraps. After lunch, we took the Streetcar to the Spanish Governors Palace. 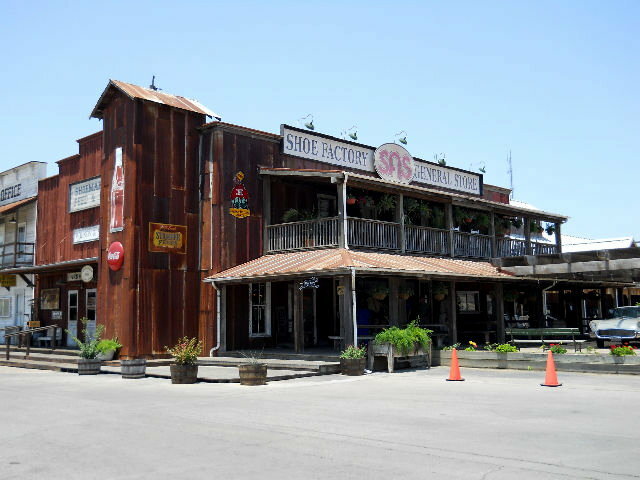 The 10-room adobe-walled structure was the original seat of government in the early 1700s. 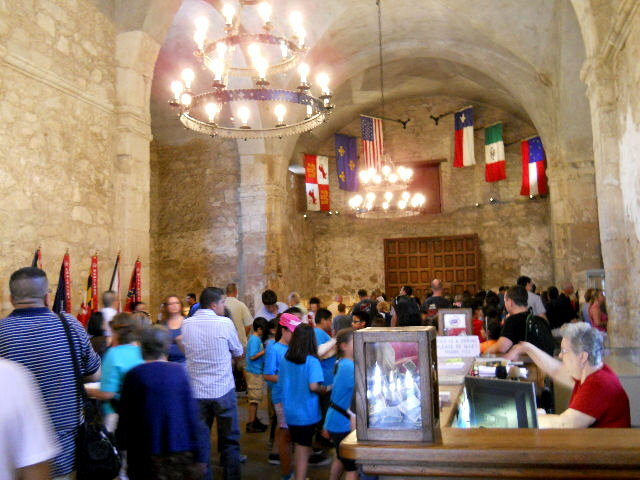 Commandants of Presidio de Bexar and many Spanish governors lived and ruled in the building, which features hand-carved doors, low beam ceilings, a grape arbor and a mosaic-tiled patio typical of Colonial Spain. We then took the Streetcar to La Villita. It is a restoration of San Antonio's earliest residential settlement. Adobe and Victorian cut limestone houses along the cobblestone walkways now hold shops, art galleries and a museum of La Villita's history. We enjoyed walking through the shops and visiting with some of the shop owners. < Spanish Governor's Palace. < La Villita. 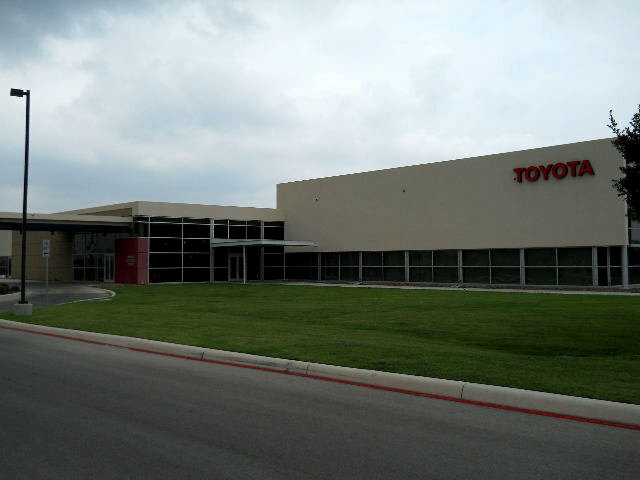 [Thursday] Today we have an afternoon tour of the Toyota factory. We had some time in the morning, so we took the short drive to Mission Concepcion for a tour. 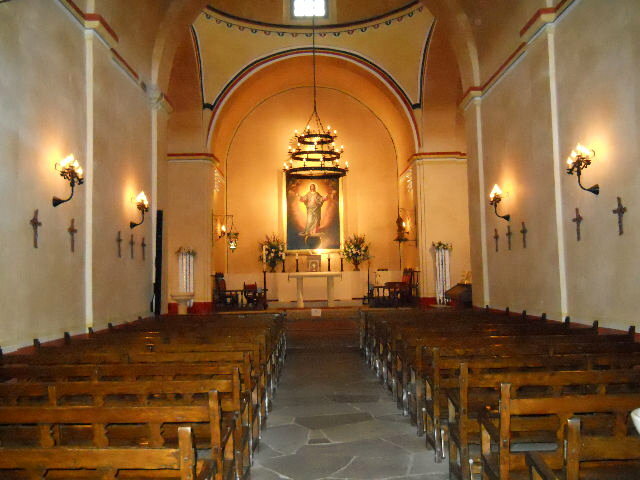 The church looks essentially as it did in the mid-1700s as the mission's center of religious activity. Missionaries worked to replace the traditional Indian ritual with religious festivals teaching Christian beliefs. Many displays show life in and around the missions during the 1700s. 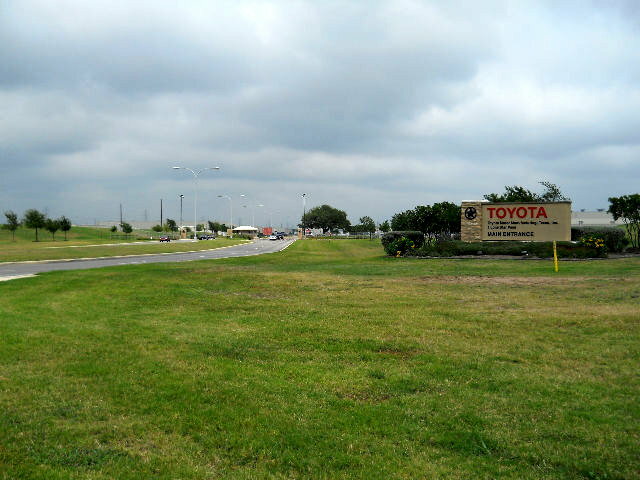 After lunch, we drove to Toyota Motor Manufacturing, Texas, Inc. We checked in at the Visitor and Education Center, located next to the sprawling final assembly facility. The Toyota plant is 2.24 Million sq. feet and there are on-site suppliers that contain another 1.875 Million sq. feet. They do the final assembly of the Tundra and the Tacoma trucks. The annual capacity is 200,000 vehicles. The tour was conducted by a very knowledgeable employee in their kaizen section. You ride the "train" throughout the plant, getting very close to the assembly operations. This was an excellent tour - one of the best we have been on. It is much more instructive than previous General Motors plant tours we have taken. The Visitor Center provides a nice display of operations for folks that were not registered for the tour. Of course, no pictures were allowed inside the plant, but outside, we clicked away. 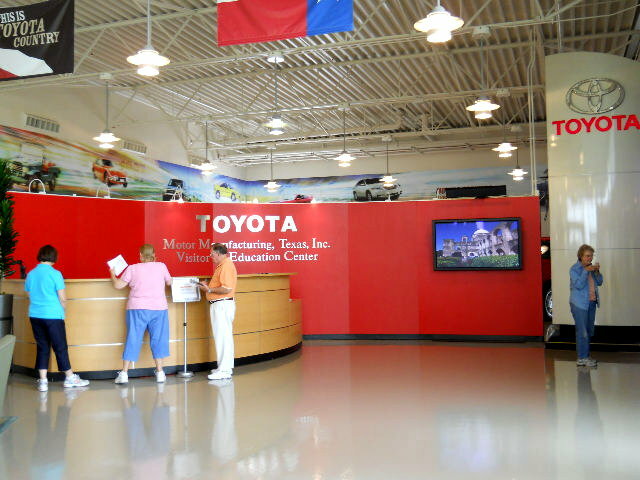 < Toyota Visitor Center. < Inside Visitor Center. < Main Plant entrance. After the plant tour, we had time to complete our tour of the 4 San Antonio Missions by stopping and touring Mission Espada (1690) and Mission San Juan Capistrano (1731). Espada was founded in 1690 as San Francisco de los Tejas, the oldest of the East Texas missions, and was moved to the San Antonio River in 1731 and there renamed San Francisco de la Espada. 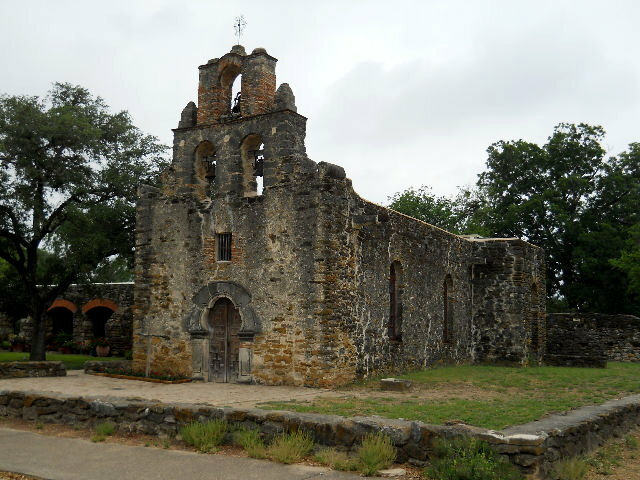 Mission San Juan Capistrano was originally San Jose de los Nazonis in East Texas. In 1731 it was moved to its permanent home on the San Antonio River's east bank. < Mission Espada. < Mission San Juan Capistrano. [Friday] We caught #34 to downtown for our last day of sightseeing. 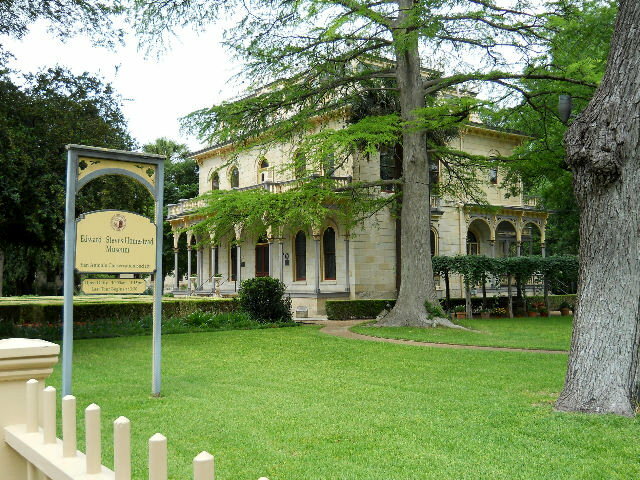 Our first stop was in the King William District to complete our walking tour of the historic homes using the San Antonio Conservation Society's guide. < Faithful Via bus #34. We started at the King William Visitor Center to see the displays giving history of the King William district. 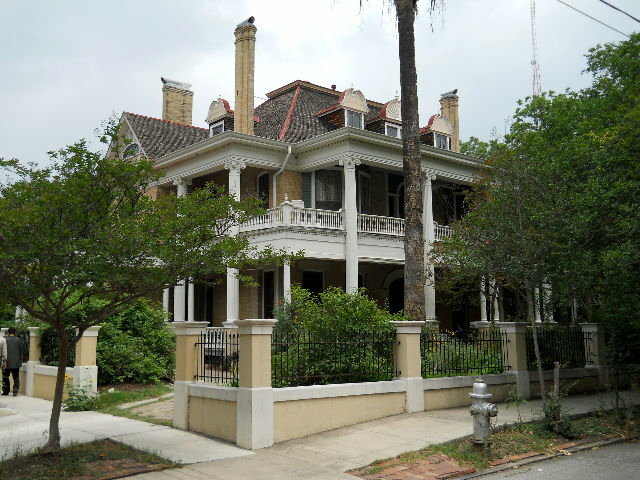 Afterwards, we walked along King William and Madison Streets stopping at the historic homes and reading details from the Walking Tour brochure. One of the interesting homes was the Alexander Joske House. 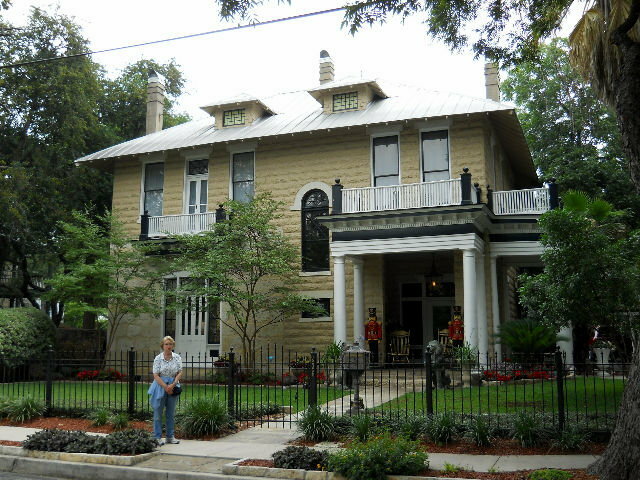 The Colonial Revival house was the home of the son of the founder of a Texas mercantile empire that became known as Joske's of Texas and served its citizens for over 100 years. < Alexander Joske House (ca. 1900). < Ernst Altgelt House (ca. 1866), one of the oldest. We then caught the Blue Via Streetcar to the downtown Riverwalk area. We walked around the downtown again, rode the Yellow and Red Streetcars on their routes and ended up at the King William district for a final few homes. Then on to #34 for our trip back to the truck. [Saturday] We left San Antonio after breakfast and after stopping along the way for lunch, we arrived back home in Richmond in the early afternoon. This draws to a close our visit to San Antonio, Texas. We hope you enjoyed the photos and brief descriptions of our activities. God willing, join us again soon for another RV adventure.